Begin by speaking to Eluned near the Roving Elves. 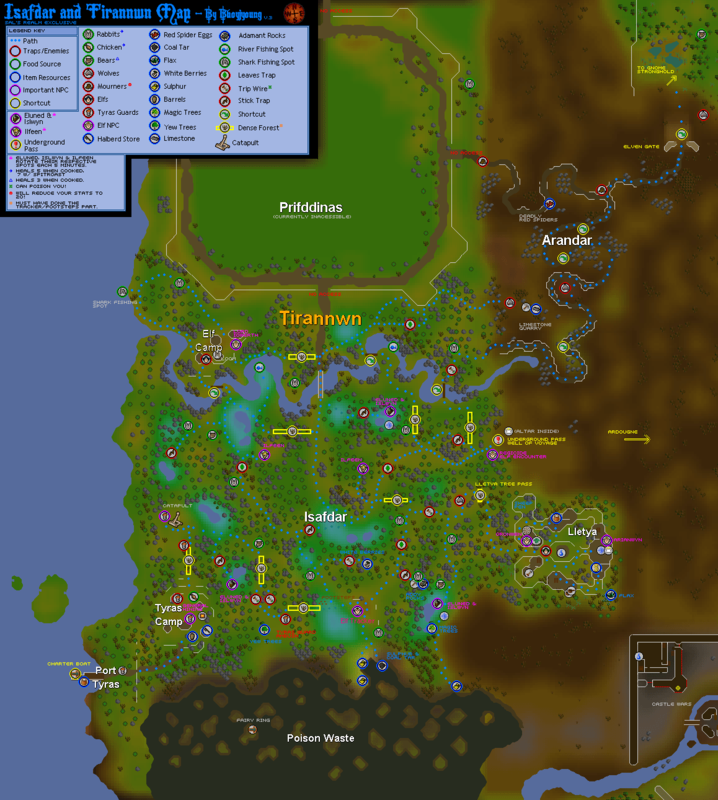 Start by looking for Eluned at either one of the Roving Elves spots shown on the Map of Isafdar. If she isn't there, hop to another world. Talk with her, she says Arianwyn requests a meeting with you in Lletya. She will take you there if you wish. Once you're there, you'll receive a Teleport Crystal Seed with 4 uses. Use this to teleport to Lletya. You can recharge it for 750gp from Eluned, but you'll only get 3 Charges instead of 4. Arianwyn will inform you that the Mourners are in fact Elves, and that there has been many sightings in the mountain pass in Arandar. Head to the mountain pass and wait for a Mourner to come by. Attack him, and he will throw a vial that reduces your hits and other stats to 20, but that shouldn't be a problem if you brought food and potions. 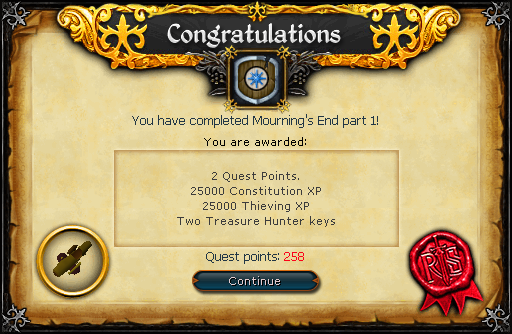 Once he is dead, you will get a Letter and a full Mourner set, although 2 of the pieces are unusable. Bring the Broken Trousers to Oronwen in Lletya with 2 Silks and 1 Fur. She says that these pants are made for Elves but are not made by Elves. She will fix them, and you will be able to wear them. You will also need to purchase blue, green, yellow, and red dye from Oronwen (it is recommended to buy 2 or more of each). To clean the blood stain from the top, go to the lake south of Taverley, just west of the tree patch, and ask Tegid about cleaning blood stains. Steal his soap from the Laundry Basket and use it with the jacket while carrying a bucket of water. Now you are ready to infiltrate the Mourner's Headquarters. Make sure that you have feathers, soft leather, a magic log, a Toad Crunchy and the Letter. If you remember where you have sabotaged the Mourner's soup in the Plague City Quest, this is the place to go. To enter, you must only have your Mourner Set equipped. Go downstairs through the trapdoor in Mourner's HQ. Talk to the real Head Mourner, and you will get some interesting info on what's going on. He will ask you for paperwork first, so hand him the Mourner's Letter. 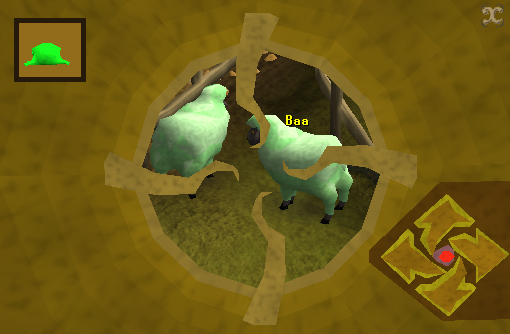 After his story, he will need you to re-dye the farmer's sheep (from the Sheep Herder Quest), but, the device is broken. He will give you a key and a Broken Device, which the Gnome next door can fix. You will need to use a feather on him twice, show him the crunchies after, and then he will tell you to bring the materials to fix it (a Magic Log and Soft Leather). Right click him and release him. Wait a bit and talk to him again to get your fixed Strange Device. Now you will need to make some ammo. Remember those 4 Colored Sheep groups in the Sheep Herder Quest? Well, those are the ones that you must re-dye. You can get Dye From Lletya's Clothing Shop Or Aggie in Draynor. However, to Re-Dye the Sheep, you will need to fire an ammo of some sort on them. Green - Mix a Blue and a Yellow Dye together. You need 1 dye per toad, and you need to hit the Sheep once with the corresponding color for them to be colored properly. 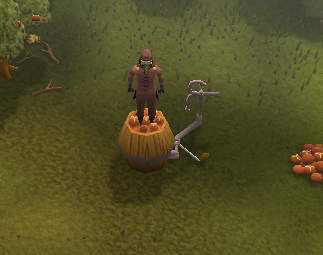 Head over to the toads from the Big Chompy Bird Hunting Quest, make sure your bellows are empty, and use a dye on the bellows. Use the dyed bellows on a frog to get a frog of that color. If you need help finding the area, check out the Chompy Hunting Grounds Map. Get 1 Frog of each color. If needed, you can take extra frogs if you think you may miss. To shoot, add 1 Frog to the Ammo Chamber of the Device, select the "choose attack style" option, and select aim and fire. In the top left corner you will see what ammo is currently being used. 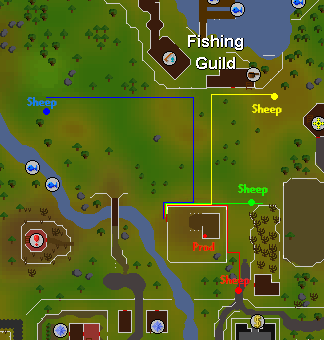 If you need help finding the sheep, check out the Sheep Location Map. On the Bottom right, you'll see 4 Directional Arrows and a red button. Aim with the arrows and shoot with the red button. You only need to shoot one sheep of each group. They will be significantly more colored if shot correctly, and you won't have the option to Prod them anymore. 1. Who made the poison. 2. What the poison was made from. 3. How the poison can be made. 4. Produce enough to poison a lot of people. 5. Contaminate the food store. First, Go to Elena 's House, which is located on the west side of the river from the Biohazard Quest. Talk to her, and after telling your story, she wants a sample of a Rotten Apple. Now, between the Training Camp and south of the Gnome Stronghold is an abandoned apple yard. Take a Rotten Apple from 1 of the piles there and take 2 Barrels. Take a scoop of the rotten apple pile with 1 of your barrels, and use it on the Apple Barrel to mush them. Head back to Elena and show her the single Rotten Apple. She will give you a Sieve afterwards. Now, you need to make some Naphta. 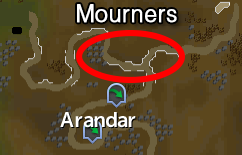 Get some Coal-Tar with your barrel back at the swamp in Isafdar (you can find this just south of the Tirannwn lodestone). Talk to the Chemist in Rimmington and then pour the Coal Tar into the Distiller on the Still. Put some Coal inside and the heat will increase. When the heat level turns green, turn the right valve on. If the pressure goes over the green level, turn the left valve on. Don't let the pressure get too low, so be sure to close the valve when it goes below the green level. Do this until the Coal-Tar is distilled (the bar is completely green). Once you have your Naphtha, use the Barrel of Naphta on the Barrel of Apple Mush and you will get A Naphta-Apple Mix. Use the Sieve on it and you will get a barrel of Toxic Naphta. Warning: Toxic Naphta is very flammable and should only be heated on a range. Using it on an open fire will cause it to explode! Use the Toxic Naphta on a range to heat it. After you've used it on the range, you will get 2 Toxic Powders. 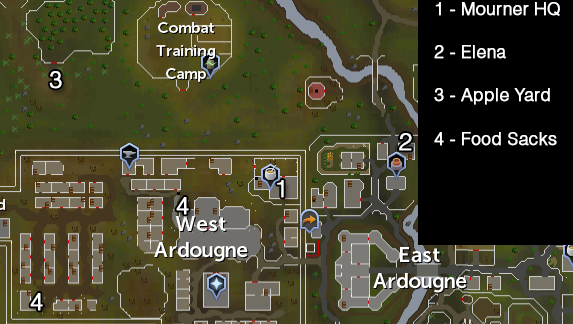 Use them on the grain sacks at the 2 different places marked on the Ardougne Map. After you have done that, go back to the head mourner, and the quest will be completed! [^] Kill Mourner and get everything it drops. [^] Use Soap with the bloody top. [^] Enter the Mourner HQ. [^] Go down the trapdoor. [^] Speak to Head Mourner. [^] Use the Mourner's Letter on Head Mourner. [^] Go to the next room with gnome. [^] Use Feathers on the Gnome twice. [^] Use Toad Crunchies on the Gnome. [^] Speak to the Gnome. [^] Speak to him again to get a Fixed Device. [^] Use Red, Blue, Yellow and Green Dyes on Bellows, one at a time. [^] Use Dyed Bellows on Swamp Toads. [^] Use Colored Toads on the Strange Device. [^] Select "Aim and Fire" attack style. [^] Shoot the sick sheep with the same color toad. [^] Report to Head Mourner. [^] Take a Rotten Apple. [^] Use Barrel on the Rotten Apple pile. [^] Use Apple Barrel with mushing barrel. [^] Use Rotten Apple on Elena. [^] Use Naptha on the Apple Mush. [^] Use Sieve on the Naphta-Apple Mix. [^] Use Toxic Naphta on range, not fire! [^] Use Toxic Powders on food sacks. [^] Speak to the Head Mourner.